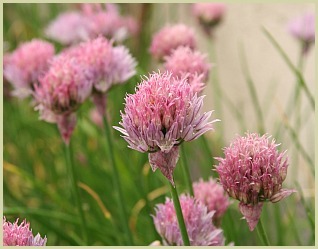 If you're new to herb gardening then growing chives is a really good herb to start with. The smallest member of the onion family, the plants are evergreen hardy perennials that self propagate. So once planted will regrow each year with the minimum of care. They also love thrive in containers and will supply you with a large supply of grass like leaves throughout the growing season. The pretty pink flowers are also edible and have a tasty onion flavour. And if you dry the leaves you can have a supply over the winter. A sunny spot is the best place for chives, although they will grow in partial shade. They like a rich well-draining soil, so dig well-rotted manure or compost into the herb bed a few months before planting time. They are easy to grow from seed and if you have established plants a few years old you can divide the roots for new, smaller plants. Over the winter you can grow chives indoors on a sunny windowsill. After the last frost has gone, you can plant out your indoor grown seedlings by carefully removing them from the pots and plant the clumps 10-12 inches apart. Cover with ¼ inch (1cm) compost. They need to be kept well watered at all times particularly in dry weather. If they dry out the leaves will turn brown. Water well especially in hot weather. Wash any aphids off with a horticultural soap solution. Like mint they can suffer from rust (I've never had this problem). If this happens destroy infected leaves by burning them. From seed you will be able to snip the leaves after about 90 days. From root division it will take about 60 days. Snip the leaves near the base and cut from the outside of the plant in. Whilst the flowers are very tasty and attractive, if you want to only chives for the leaves, cut off the flower heads and you will get better growth. It can be a good idea to let the plants get established for a year as you will yield a much better harvest. Early Spring: Sow chive seeds inside. Spring: Divide older plants. Plant out seedlings or sow seeds in the garden. Summer: Harvest the leaves. Keep well-watered. Autumn:Harvest the leaves and cut the herb back to 2 inches (5cm) above the soil. Winter: Dig some well-rotted compost or manure in to herb bed.